Ladies’ Monthly Museum, May 1819. This publication, which began life in 1798 as the LADY’S Monthly Museum (the plural possessive seems to have kicked in around 1815) has an interesting history of fashion prints. The prints always showed multiple figures. During the early years the prints were original, and though sometimes a bit crudely engraved and painted, they were always charming. Around 1809 or so, they began copying prints from Ackermann’s Repository of Arts, taking the two Ackermann prints from the previous month and re-drawing them as a two-figure print. Ten years later, as in this print, they are apparently creating original prints again, as I can find no corresponding prints in any of the English or French publications. The descriptions of the prints, as well as general fashion commentary, has also expanded significantly. Perhaps a new fashion editor was in charge? 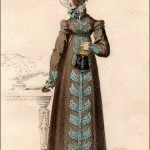 “Walking Dress: A round dress, composed of jaconet muslin; the skirt is moderately full; it is trimmed round the bottom with the same material, which is disposed in such a manner as to form, with an intermixture of cord, a very novel and fanciful trimming, for the form of which we refer to our print. The body is made en chemisette, but has very little fullness. Long sleeve, the upper part is very full; it is drawn in compartments with cord, so as to form a full epaulette; the lower part is finished by a cuff to correspond with the bottom, but considerably smaller. There is a small, high collar, edged with narrow lace. 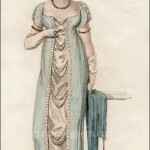 The spencer worn with this dress is composed of blue satin, of a delicate shade; it is made tight to the shape; the back, of the usual breadth, and has a high standing collar, which, s well as the epaulettes and cuffs, are richly braided with white silk cord. 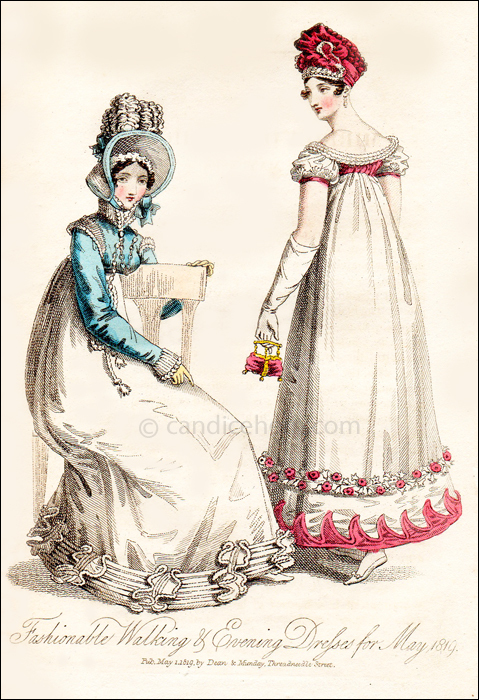 Head-dress, a gipsey bonnet, composed of white gros de Naples; the edge of the brim is ornamented by a rouleau of blue satin; it tied under the chin with blue satin strings; and it is ornamented with a plume f down feathers, at the base of which is a blue satin bow. A cornette, with a full border of narrow lace, is worn under this bonnet. Gloves and shoes to correspond. Note the tiny bodices. This late period (1817-1819) showed very high, very small bodices, especially for evening wear. By 1820, the waistline begins to creep down, and by the late 1820s we see natural waistlines again.